Ahoy, mateys! 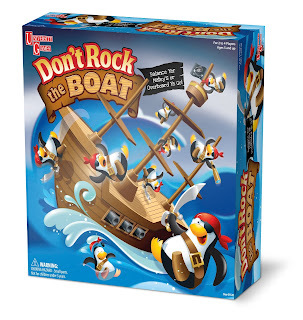 Get ready to set sail on a rockin’ new adventure with a crew of 16 super cute pirate penguins. Take your turn balancing the pirate penguins on top of the ship without making it tip over. Be careful though because if you rock the boat and send the penguins overboard, you lose! It's a great new balancing game for all the family to enjoy, although it is aimed at children aged 5 and over my 3 year old son has been joining in the fun too. We love a good game after dinner time here in our house so last week we set up our Don't Rock The Boat for a quick quick game. It's very easy to set up, you simply click the masts onto the boat and place the boat on top of the plastic pretend wave. From box to table, It's ready to play in seconds. It's a very nerve wracking game of skill which takes lots of patience as it tips over a lot. 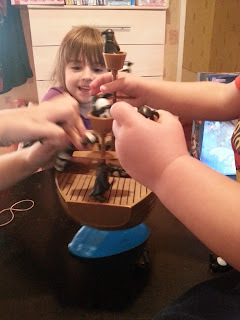 It's quite a tricky game to play as balancing the pirate penguins is quite hard to do but we had lots of fun trying. My girls loved this game, there was lots of giggles and screams during our game. It's recommended that you play with between 2-4 players but I guess you can play with as many or as little as you like. 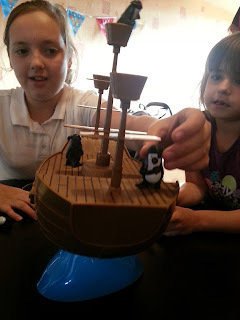 We played with the 4 of us and had a great time, with 16 loveable pirate penguins there is more than enough for everyone as it normally tips well before you get to use them all, in fact I don't think we got past adding the fifth penguin during our games. 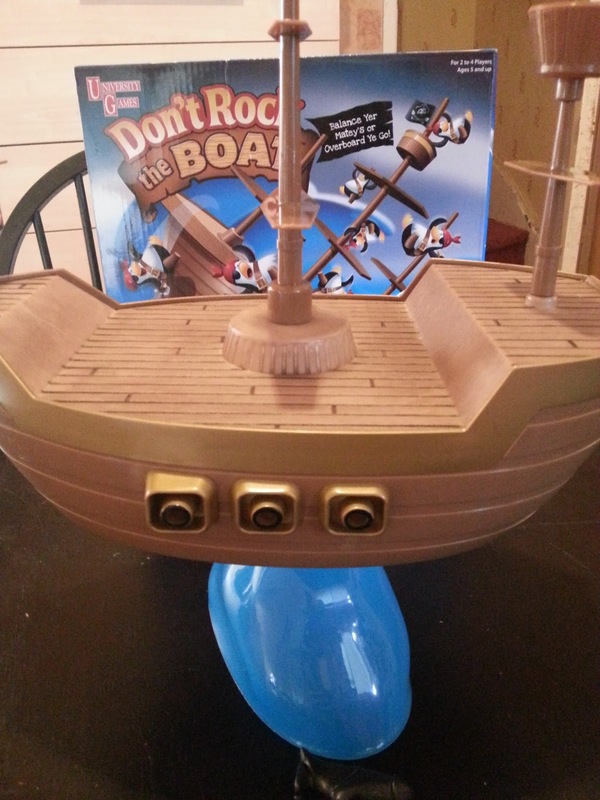 We really enjoyed playing Don't Rock The Boat, it's a fast paced free for all at times but it's great fun and the excitement builds very quickly as everyone waits for the boat to tip over sending all it's little pirate friends flying everywhere. We gave this game a fantastic score of 4/5, it's easy to set up and very easy to play. It's a simple game idea of balancing penguins on a ship, anyone can do it. I'm sure we will continue to enjoy playing this game for many more family times to come, it's a real giggle and delight to play together. A firm thumbs up from us!